This is the final night of Oikos for the Spring. We can’t wait to see you there! 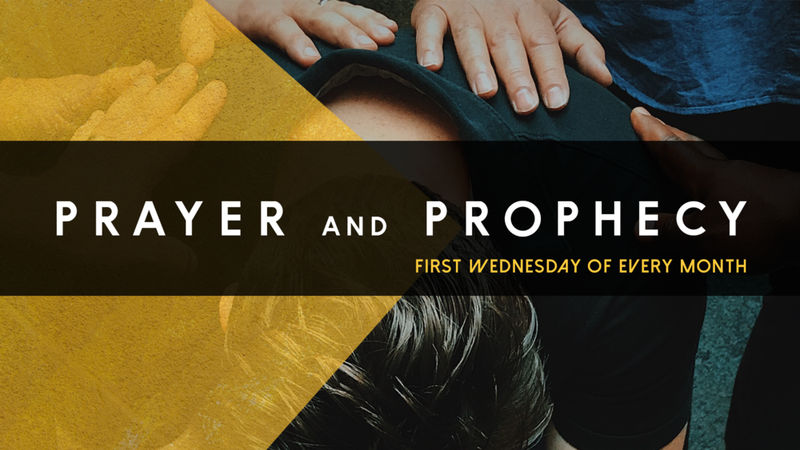 On May 1st, the prophetic team at Cross Life Church would like to pray and minister to you through prophesy. 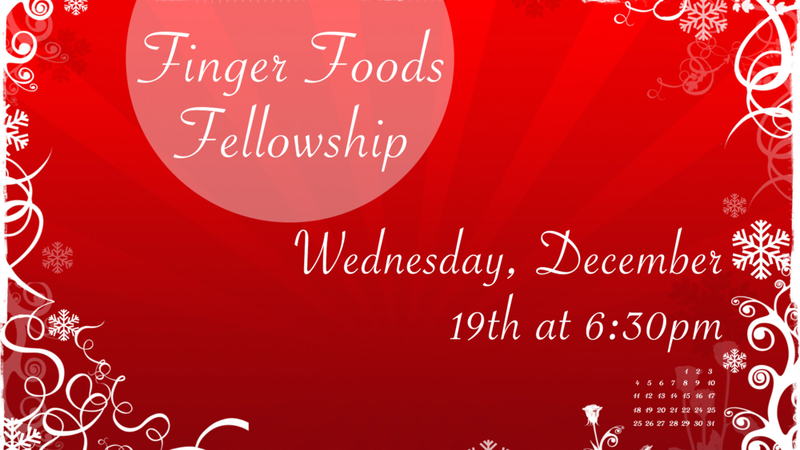 They will meet from 5:30p-6:15 in the classroom on the west end of the church on the main floor. Feel free to drop in and be encouraged. We invite you to join us on Saturday, May 4th at 9am as we pray for the the move God around the world. You can join us in person at Cross Life Church or online on Facebook Live. We are so excited to start our summer session of Oikos on May 26th. Learn more about it and sign up today! 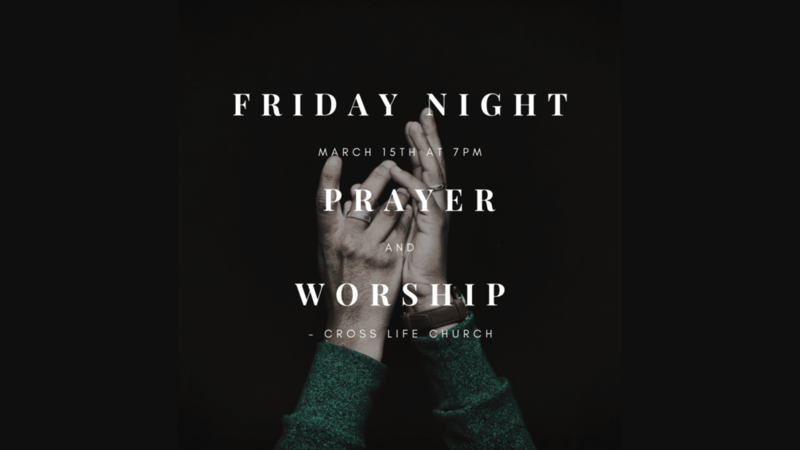 Join us Friday, April 19th for an evening of prayer and worship at Cross Life Church celebrating Good Friday. Prayer will begin at 7pm in the sanctuary. We invite you to join us on Saturday, April 6th at 9am as we pray for the the move God around the world. You can join us in person at Cross Life Church or online on Facebook Live. In the fourth part of the series, Pastor Chester will be talking about talking. One of the biggest problems in marriage is often communication. In this message, you will learn how to better communicate with each other in your marriage. This is our third night of Oikos and we can’t wait to see you there! 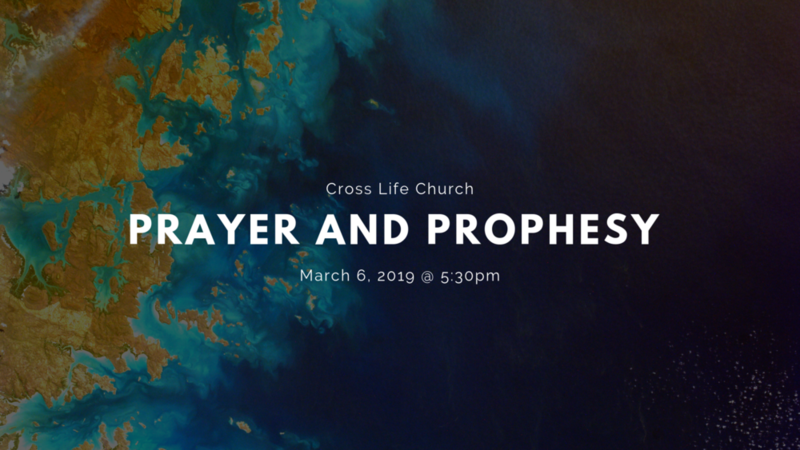 Join us Friday, March 15th for an evening of prayer and worship at Cross Life Church. Prayer will begin at 7pm in the sanctuary. We will also be live streaming the prayer service on Facebook Live and Youtube. On Saturday, March 2nd, we will be going to the Wildwood Trailer Park and handing out gift bags to the residents. If you want to help us, we will meet at the church at 9am for prayer and then we will leave at 10am to go the outreach. We invite you to join us on Saturday, March 2nd at 9am as we pray for the the move God around the world. You can join us in person at Cross Life Church or online on Facebook Live. This is our second night of Oikos and we can’t wait to see you there! The Cross Life Student Ministry would like to invite you to breakfast Sunday, February 17th from 8:30-9:30 in the fellowship hall. Bring your entire family and enjoy a free and tasty breakfast served by our young people. Oikos means family👨‍👩‍👧‍👦, and we hope that by spending a little time together, we can become more than a church but a family. To help facilitate that we have small groups that meet only four times at one of our host homes🏡. There you can get to know people you didn’t know before in a relaxed atmosphere. After four meetings, if you would like to still be involved, we switch up the groups and the homes and start again🙌. For this round, we will meet on January 27th, February 24th, March 24th, and April 28th. 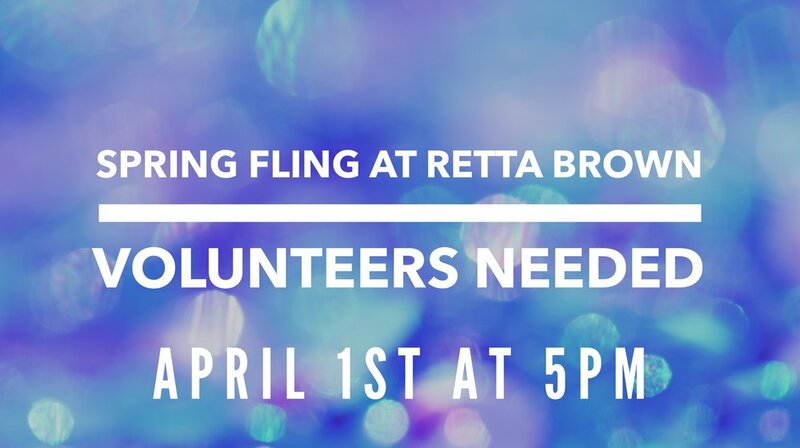 We meet with some great couples starting at 5:30pm, and it only lasts for a couple of hours😆. There will be food, conversations, and lots of laughter. You will be sure to enjoy hanging out with old friends💁‍♀️ and meeting some new ones as well💂‍♀️. We also provide free childcare at the church🥳so this is an excellent opportunity to relax a little! All you have to do is register at www.crosslifechurcheldo.com/oikos. Even if you have signed up in the past, please register again! We are excited to have Ryan Johnson with us on Sunday, January 27th. Ryan operates in a prophetic anointing and has a Word from God for our church. 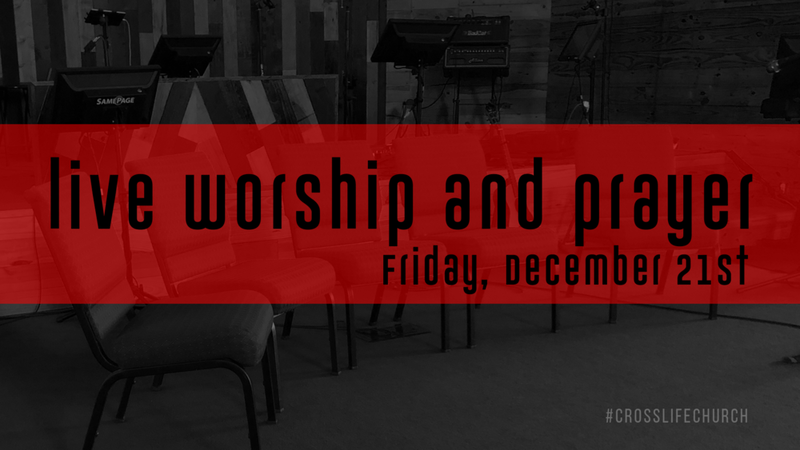 Join us on Friday, January 18th for an evening of prayer and worship at Cross Life Church. Prayer will begin at 7pm in the sanctuary. We will also be live streaming the prayer service on Facebook Live and Youtube. Happy New Year! Stay home and work on those goals! Pastor Mark Day will be bringing a great message to Cross Life Church on Sunday, December 30th at 10am. Stay home and enjoy some time with your family!